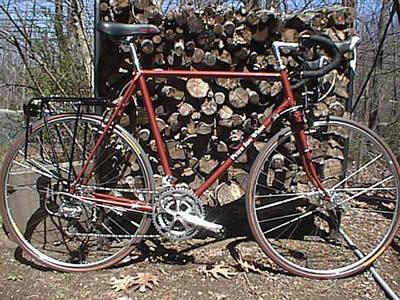 I used to build road racing, randoneuring, touring and hard-tail ATB bicycles. This is a simple page I had to show a few pictures of some bikes I'd built. But I'm not building any more. I'm not going to build frames in the future. No, I haven't changed my mind since typing this. So there's no point in calling or emailing to check "just in case" I've decided to start building again. I build road racing, randoneuring, touring and hard-tail ATB bicycles. There are enough welded bicycle frames in the world today. I don't need to add to the total. So all of my frames are lugged and soldered, an old fashioned but elegant way to build a frame. I use beautiful cast lugs from Henry James in California, and a variety of steel tubing from True Temper in the US, Reynolds in England, and Vitus in France. While you can buy just a frame from me, most people choose to get a complete bike, either fully assembled, or as a kit with wheels built by me, and the bottom bracket and headset components installed. You'll save some money with the kit, since you'll be doing most of the setup, instead of me. I can ship bicycles and kits to any location in the USA. And remember, if you choose the kit, I won't leave you high and dry. I'm available just about any time to help you with setting up the gears or brakes, or any other questions you might have. 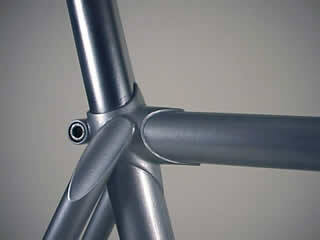 This shows the "Henry James" fork crown and some lovely Campagnolo cantilevers. The tires are Continental "Top Touring 2000, 700x32. Sadly, the Campy brakes were discontinued long ago. This customer got one of the last sets from my "personal stash". This shows the elegant "Henry James" seat lug and the hand made flutes on the seat stays. Many fluted seat stays are in fact factory produced solid steel plugs that the builder inserts into the top of the seat stay before brazing the stay to the seat lug. This adds considerable weight to the frame and often leaves a seam around the stay just below the flute. I make my fluts by hand filing the end of the stay and brazing on another piece of tubing at an angle, then filing off the excess. It's a lot more work, but it's much prettier and saves weight. This bike is fitted with an Ultegra STI group but with Schmidt hub and Busch&Müllerlights. The rear rack is a Tubus Cargo, rims are Mavic MA-3 with Continental Ultra 3000 tires. The customer uses it for commuting, light tours and brevets. There is no "stock" Peter Jon White bicycle. Everything from the frame tubing, frame geometry, component selection and color will be decided by you after a careful consultation with me. I've selected sample component kits that I believe offer the best value for a particular type of riding and your budget. But these selections are not carved in stone. You can make many changes as well as deletions from these kits. Here's a two year old Peter Jon White touring bike set up with a Brooks Team Pro and Carradice Nelson Longflap saddlebag on a Bagman Support. The paint is Imron Light Violet Metalic #44491. The frame tubing is Vitus GTI with True Temper chainstays. 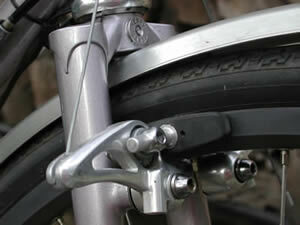 Choose between long reach caliper brakes and cantilever brakes on randoneur bikes. Decide on how much tire clearance you need. Will you want to be able to use a really wide tire for loaded touring, even though the bike will primarily be used for day rides? A double or triple crankset? STI, bar-end or downtube shifters? A full lighting system with hub or sidewall generator? 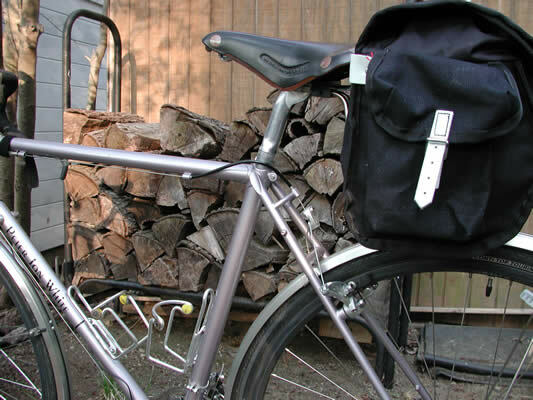 Do you need racks and panniers, or just a saddlebag? Whatever your needs, I can accomodate you.